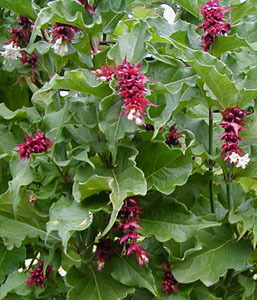 Joy Creek Photo Archive (c) all rights reserved Leycesteria formosa is a superb understory plant notable for its green, bamboo-like stems and long pendulous strands of white pagoda-like flowers with red-purple bracts which continue to set black fruit over a long period of time. The fruit attracts wildlife. It is edible and tastes of burnt caramel. A Great Plant Picks selection. Summer to fall. 8 ft.